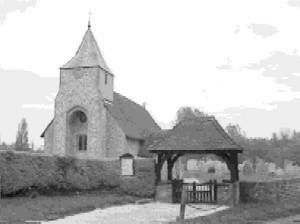 St Nicholas, West Itchenor, Sussex. Itchenor is well known today as a centre of yachting on Chichester Harbour. The name derives from Icca, a Saxon chief who settled here, and 'ora', a Saxon word for a bank on the shore. The small, but immensely attractive church of St Nicholas is set on a small hillock beside the road leading to the harbour. Dating from the late 12th century it is a rectangular building only 50 feet long and 16 feet 6 inches wide, with no structural division between the nave and chancel. The oldest furnishing in the church is the octagonal font of the 13th century set on four subsidiary columns on a moulded base. The roof, the stained glass and almost all other furnishings date from this century. All this work is of fine quality and the beauty of the church has been much enhanced. 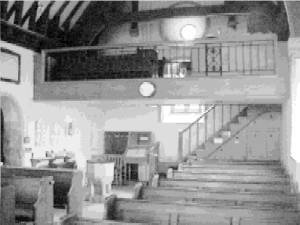 A fine wooden gallery was built at the west end in 1964 as a War Memorial to the men of Itchenor. This information and picture come from the pages written by John Symonds for the Waterlooville's On-Line Parish Magazine. Link here. Three bells hang in the tower, two dating from the seventeenth century whilst the treble was made by John White of Reading in 1530.